Combining tradition with technology to protect your home. 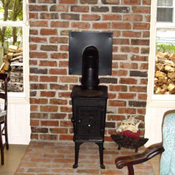 Bob & Sue, owners of Havelock’s Chimney & Venting, Inc. believe that old-fashioned traditions such as quality and service can be combined with the latest technologies to provide the best service experience you’ve ever had at home or work. Incorporated as Havelock’s Chimney Sweep in 1984 we have provided eastern North Carolina with chimney maintenance and restoration unlike any other company in our service area. We use the latest tools and technology to ensure that your chimney and dryer venting systems are operating at optimal levels. All of our technicians are CSIA-certified specialists—up to date on NFPA standards and state and local codes, and ready to address the particular needs of your home. We provide comprehensive, reliable services that have stood the test of time. With Havelock’s Chimney & Venting, Inc., you can rest easy knowing that our primary objective is to make your home heating and venting systems cleaner, safer, and more energy-efficient. Havelock's Chimney & Venting, Inc., (252) 447-3611, fax: (252) 447-3611, chimneys@embarqmail.com | Base Content Copyright © 2019 Market Hardware, Inc.